Since started internship a few weeks ago, I'm now responsible for six different email addresses. Yes, six! Trust me, I would combine them if I could, but they're separate accounts for a reason. On an average day I get between 50-100 emails total from all of the accounts. One is my personal email address that I use for school (I have my school email address forwarded to this account), family, close friends, bills, etc. One is my RCSOATL blog email address that I use for blog business, blog comments, news subscriptions, blog subscriptions, etc. One is for my communications company email address, one is for my graduate research position, one is an organization email address, and the newest one is for my internship. Wow, that sounds even crazier after typing it. But managing all of them isn't bad at all. And I don't let emails go more than 24 hours without responding to them. 1. Have a system | Like any other organization method, it's important to find and stick to a system that works best for you. I've gained new email addresses over the years and I've figured out what really works for my schedule and lifestyle. Below are a few tips based on the system I use to manage multiple email accounts. 2. Differentiate your accounts somehow | My biggest fear when it comes to having multiple email accounts is that I may respond from the wrong address or mix up emails somehow. To try and avoid this, I make all of my email accounts (on the web) look different by using different background images and default images. Google mail makes this really easy to do. And my two work emails naturally have unique appearances. I also really utilize the folders options on all of my email addresses. I do not like having an email in my inbox after I've read it and handled it. So it will either be deleted if I know I won't need it later or it will go in one of my folders if I feel I may need it later. Lastly, I use different email signatures for each account to help keep track of them when exchanging emails with other people on my phone or my laptop. 3. Forward & link emails if possible | If you have the option of forwarding or linking email accounts, this definitely makes things easier! My gmail accounts are linked so that I can switch between inboxes quickly. However, forwarding does not work for my other accounts because I have to respond from the appropriate account. 4. Don't unmark it until you've responded or acted appropriately | I can't stress this one enough. People who I know that struggle with email seem to make the mistake of reading an email, not responding, and not remarking the email as unread. It's easy to do this and eventually forget about a message, causing you to miss a deadline or just seem unorganized. I always keep emails marked as unread until I have handled them, and it really helps me tackle every single email appropriately and in a timely manner. 5. Add the most used accounts to mobile devices | My personal, blog, and company email addresses are on my mobile device because I feel the most connected and invested in those accounts and the emails I receive from those accounts. And I am known for responding to emails at a lightening speed when it comes to these accounts because they come to my phone like text messages and I can't stand that little notification bubble. If the email doesn't require more than two paragraphs/eight sentences, then I will respond as soon as possible using my phone. However, for emails that will require more time, are really important and may require more proofreading, or emails that are easier to read on a larger screen; I use my laptop to answer. 6. Schedule a time to check the other accounts and stick to it | My three other accounts are not connected to my phone and I like it that way. I'm working on not feeling so obligated to being connected and plugged in, and keeping my work emails off of my phone has really helped with that. And one of my work emails is a government account and cannot legally be connected to my phone because of potential threats over unsecured internet connections. However, that means I have to make an effort to check and keep up with these three accounts. This is where my agenda really comes in handy. I naturally check those accounts on days that I am in the office, but on the days I am not in the office I mark down on my agenda to check those email accounts. 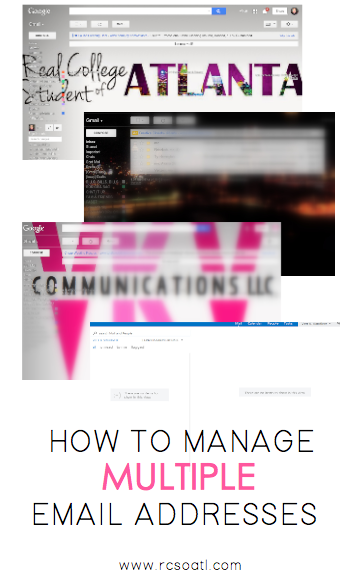 If you have any other tips for managing multiple email accounts, please leave them in a comment below! These are great tips! I have five different email accounts and if I'm not on top of it it can get a little out of hand at times. I definitely worry about responding with the wrong email address too or worse... replaying to the wrong email! Whoa, SIX email accounts!? Impressive! Right now I have three email addresses, and I'm overwhelmed (1. personal 2. work and 3. blog). I'm definitely going to look into putting my work email onto my phone. Great tips, thanks for sharing! I'm thinking about adding another email specifically for blog related things but I worry how to do the shift with everything like Disquis comments, basically everything attached to my blog - do you have any tips for this? I'm just now getting around to linking up my emails together and I must say I'm proud of my self having 5 was too stressful but these are great tips to go back and re-adjust somethings i may have miss. Wow, good job on managing 6 email accounts, you must be very organized to pull that off. Great tip too! Thanks for sharing!